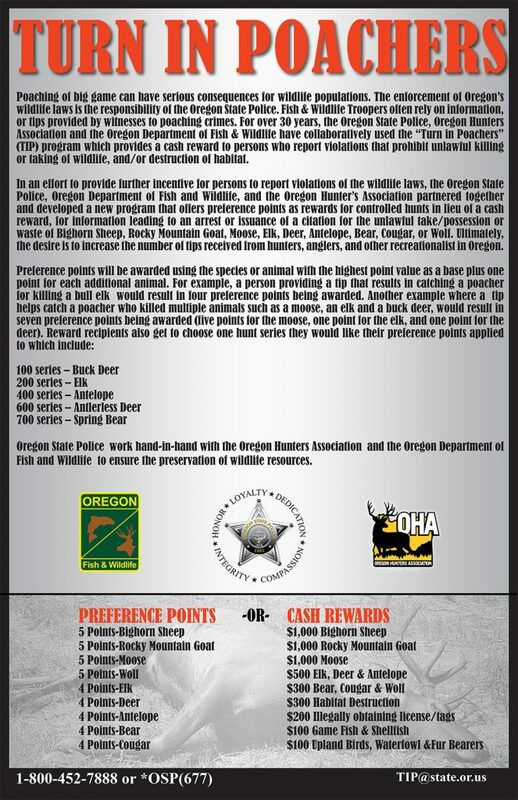 The purpose of the Turn In Poachers (TIP) reward program administered by OHA in cooperation with Oregon State Police and Oregon Department of Fish and Wildlife is to significantly reduce the illegal taking of wildlife, fish, upland birds, waterfowl, and the destruction of habitat. Qualification for the reward depends upon the issuing of a citation by the OSP Wildlife Division for illegal taking of wildlife, fish, upland birds, waterfowl, and destruction of habitat. If the investigation by OSP finds insufficient evidence to issue a citation, no reward will be made. In 2017 OHA increased the rewards offered in TIP cases and paid a record $24,200 to informants in fish and wildlife violation cases. OHA and its chapters sometimes offer higher rewards for information in particularly heinous cases. The payment to the approved reward recipient will be sent to the OSP Wildlife Division headquarters in Salem where the OSP TIP Coordinator will disperse the check to the appropriate OSP Trooper to be presented to the recipient. The TIP program also offers the option of preference point rewards instead of cash rewards for information leading to an arrest or issuance of a citation for the unlawful take/possession or waste of big game mammals.